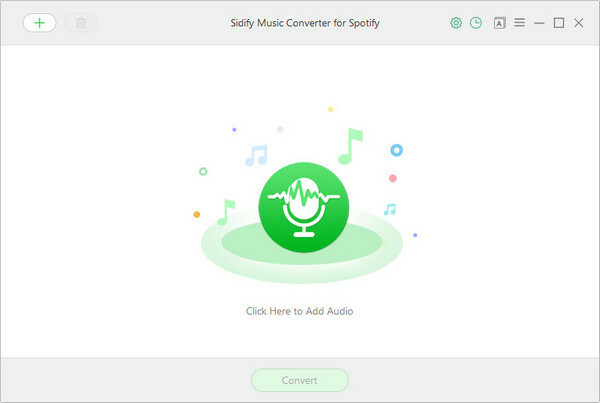 Sidify Music Converter for Spotify is one of the best Spotify music converters on Windows which can convert any Spotify song with 5X faster speed than other DRM removal programs do. Furthermore, It converts Spotify audio to MP3, AAC, FLAC or WAV format with ID3 tags kept after recording. 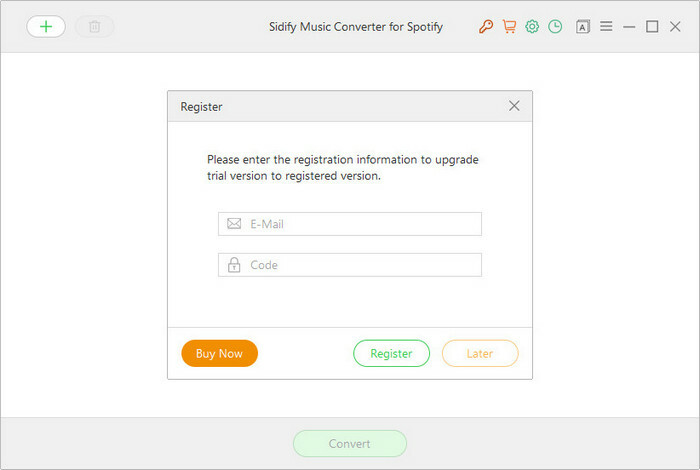 Please follow the step by step tutorial below to learn about how to use Sidify Music Converter for Spotify quickly. 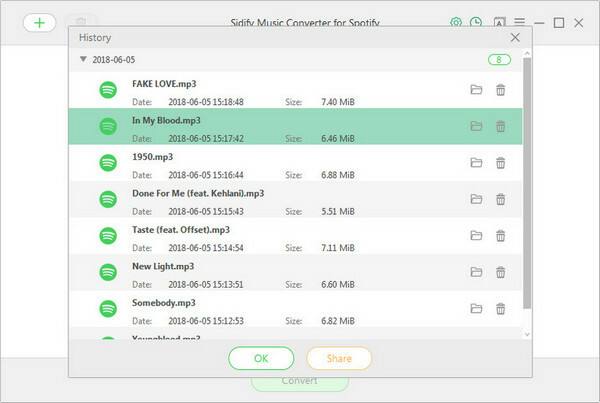 Before purchasing Sidify Music Converter for Spotify, you can try to download the free trial version of Sidify which allows you to convert the first 3 minutes of each file for sample testing. In order to unlock this limitation, you'll need to purchase a license for registering on the trial version of Sidify program. Step 1 You can directly click the " " icon to open the registration window below and complete the registration process. Step 2Copy and paste the registration Email and Code into the registration popup dialog. How to Convert Spotify Music to MP3, AAC, WAV or FLAC Format? Step1 Launch Sidify Music Converter and Spotify application will open automatically at the same time. Step2 Click button or click center of Sidify, then you will see a pop-up window which indicates you to drag and drop the songs or playlist here. Or you can add music by copying the link of playlist or song to clipboard. Open Spotify application, check the songs or playlist you would like to convert, then drag them to Sidify add window. If you don't want to convert certain songs, please click remove button to remove the music from Sidify main panel. Step 3 Click the " " button on the main interface, and then there will pop-up a window allowing you to set output format, conversion mode and output quality. 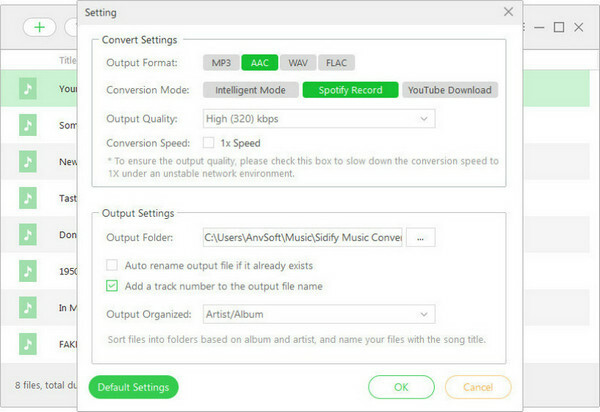 In Convert settings, you can choose output format ( MP3, AAC, WAV or FLAC), conversion mode (Intelligent Mode, Spotify Record or YouTube Download) and output quality (High 320kbps, Medium 256kbps, Low 128kbps). In the output settings, you could change the output folder as required. If you needn't to change output path, the output audio files will be saved under the default folder. Step 4 When finish customization, click "Convert" button to start conversion. After conversion done, you can find the converted audios by clicking button.